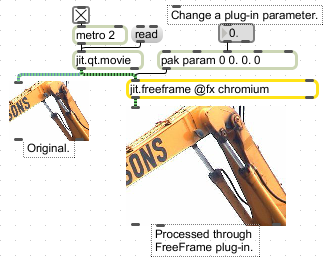 The jit.freeframe object provides support for using FreeFrame effects within Jitter. It supports both single and dual input effects, and 32-bit and 16-bit data sizes. The object's interface is complicated by the FreeFrame architecture -- each effect may have a completely different set of parameters. anything If the message selector matches the name of a parameter, functions like the param message, taking a single float (or symbol, in the case of text parameters) argument. If the message selector matches the word get, followed by the name of a parameter (e.g. getbrightness, the message has the same effect as the getparam message, but requiring no further arguments. geteffectlist Sends a list out the object's right outlet comprising the names of all available FreeFrame effects, preceded by the word effectlist. On Macintosh, FreeFrame effects must be located either in the /Library/Application Support/FreeFrame/> folder, or in a directory called FreeFrame Plugins , within the Max search path. On Windows, FreeFrame effects must be located either in the C:\Program Files\Common Files\FreeFrame\ folder, or in a directory called FreeFrame Plugins , within the Max search path. Sends a list out the object's right outlet containing the current value of the parameter specified by the param argument (either by name or by index into the list returned by getparamlist). The list is formatted as param param param-val param-display . The param argument is the name of the parameters, the param-val the value, and param-display is an alternate display value, for parameters whose "real value", as understood by the parameter, lies outside of the range 0-1.
getparamlist Sends lists out the object's right outlet describing the parameters for the currently selected effect, one list per parameter (see numparams). The list or lists are in the form paramlist param-name param-type . All parameters, regardless of type (with the exception of text ), accept a single floating-point number between 0 and 1 as input. The parameter types are: boolean , event , red , green , blue , xpos , ypos , text , standard . After all parameters have been listed, the message paramlist done is output. Selects an available FreeFrame effect for use. The effect must be specified by its name, as reported by the geteffectlist message. Sets the value of the parameter specified by the param argument (either by name or by index into the list returned by getparamlist). All parameters, regardless of type (with the exception of text), accept a single floating-point number between 0 and 1 as input. See the getparamlist message for additional information on parameter types. reload Causes the object to rescan the FreeFrame plugins folders and add any new plugins to its list of effects. See the geteffectlist method for more details. inmode symbol The matrix input mode (jitter/freeframe). The inmode and outmode attributes provide an optimization when building chains of jit.freeframe objects. Because Jitter and FreeFrame use different byte-padding, matrices generally have to be copied to a new buffer when the arrive at a jit.freeframe object, and copied back into a Jitter matrix after processing, before output. If several jit.freeframe objects will be used to sequentially process data, this copying step can be avoided. The first object in the chain should have inmode set to jitter, and outmode set to freeframe. All subsequent objects should have both attributes set to freeframe, except for the last one, which should have inmode set to freeframe, and outmode set to jitter. A value of -1 indicates that there is no loaded effect. outmode symbol The matrix output mode (jitter/freeframe).